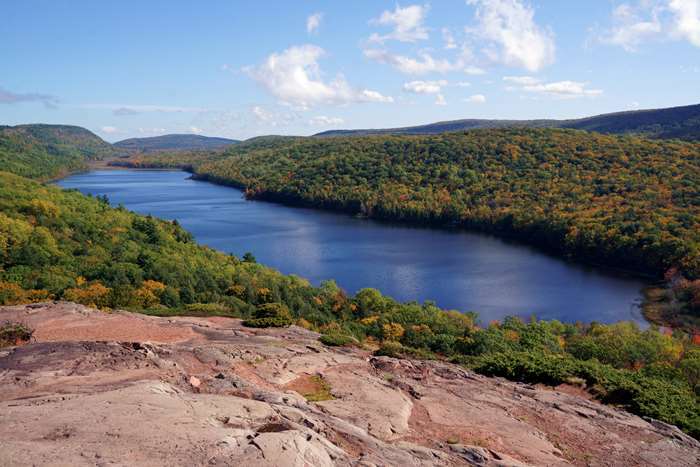 There’s something almost heavenly about the Lake of the Clouds in Michigan’s Upper Peninsula. Maybe it’s because, at times, the lake actually reflects the heavens. Or maybe it’s just a stunningly beautiful lake with an equally stunning viewpoint. Best of all, you’re not limited to just one view. 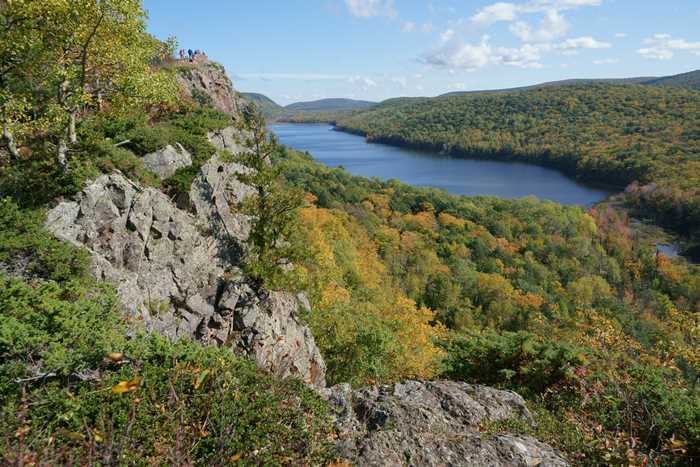 The Escarpment Trail follows a ridgeline above Lake Of The Clouds, giving you plenty of time to stare out at this U.P. wonder. Porcupine Mountains Wilderness State Park is located west of Ontonagon, Michigan, and east of the Wisconsin state line. From Ontonagon, you can access the Porcupine Mountains by heading west on M-64, then continuing west on 107th Engineers Memorial Highway, which leads into the park. To reach Lake of the Clouds, continue on 107th to the end of the road. If you’re coming from Wisconsin, take US 2 to Wakefield, then head north on County Road 519, until it enters the park on the west side. 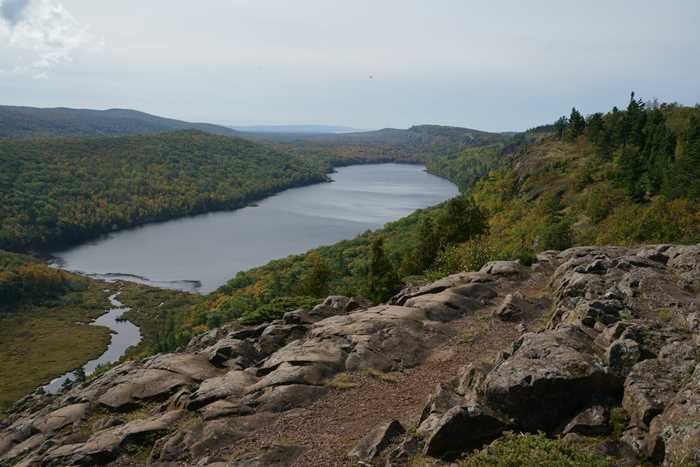 Then, the park road will take you around to the east side, to access Lake of the Clouds. You don’t have to hike very far from the parking lot to get your first view of Lake of the Clouds. The main viewpoints are on a short side-trail off the main Escarpment Trail. If you look very closely, in the upper-left-hand corner, you can see a few tiny people at the prime viewing spot. As an alternative to the Escarpment Trail, you can hike downhill from here, on the Mirror Trail, which goes down to the end of the lake, and beyond. I overheard someone talking about this trail, and how beautiful it is at sunrise. Up at the main viewpoint, there’s a large rocky clearing that gives you another excellent view of the Lake of the Clouds. You can see some cloud reflections in the surface of the lake, even though it wasn’t the best time of day for a reflection. I’d guess that early morning would be the best time for calm winds, which would allow the surface of the lake to be smooth. I backtracked a bit and rejoined the Escarpment Trail for the hike up the ridge. The Escarpment Trail is 4 miles long, one way. Two miles in, there’s a junction and a side-trail that takes you down to the road. I suppose you could park there, and hike up the hill, if the main parking area is full. As I walked up the escarpment, I found several clearings that provided good viewpoints of the lake. In between each one, the trail would rise and fall with the terrain, plunge into the forest and then re-emerge. Given the direction of the afternoon light, the best view was really at the main viewpoint, because the further up the lake I went, the less of the lake there was to see. … as the view in the opposite direction. It was around this spot that I turned around and hiked back to the parking area. I didn’t quite make it to the 2-mile point, but I’d guess that my round-trip of hiking was about four miles, once you include the side-trip out to the viewpoints. It’s worth mentioning, I was visiting the area at the end of the first week of October. As you can see, there weren’t a lot of fall colors appearing, just yet. I’m guessing the proximity to Lake Superior (on the other side of the escarpment) delays the appearance of Autumn in the Porcupine Mountains. If the fall of 2017 holds true in future years, you’ll probably catch the best fall colors in the Porcupine Mountains in the second or third week of October, possibly even later. Once I was done with the Escarpment Trail, there was still plenty to explore in the Porcupine Wilderness Park. Next, I turned my attention to the road that runs the length of the park, and a great trail right in the middle of it, to Summit Peak. 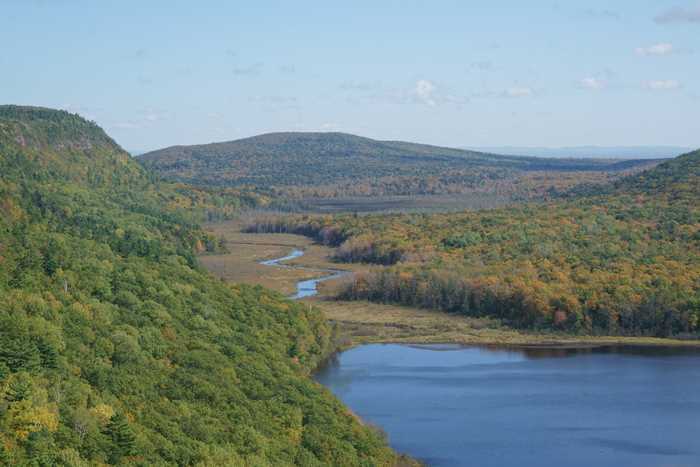 Porcupine Mountains Wilderness State Park charges an $8 per car per day admission fee. If you’re a Michigan resident, it’s $6. The Escarpment Trail offers some of the best views in this part of the Upper Peninsula. 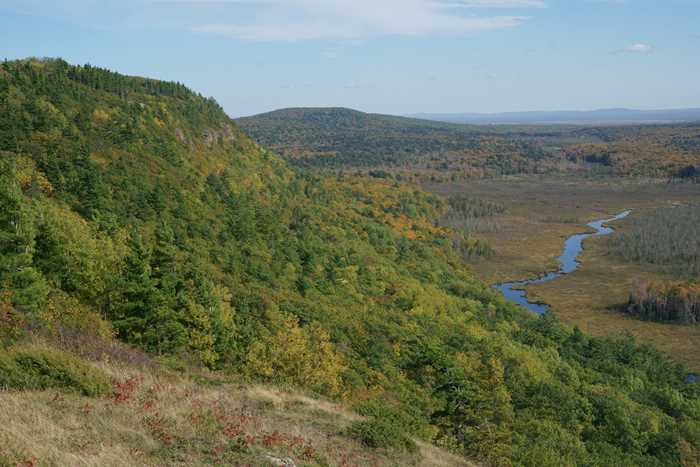 Combine it with some of the other trails and sights in Porcupine Mountains Wilderness State Park, and you’ll have quite a full day of exploration.